Quechee Inn Wedding Photos display one of the many beautiful venue options for a Vermont wedding. Built in 1793, the inn has a rich history and scenic grounds that make for lovely Quechee Inn Wedding Photos. The Quechee Inn includes 22 guest rooms, three suites, a fine dining area, and a common room. Expansive windows within the house offer stunning views of Dewey’s Mill Pond, the Ottauquechee River, and the majestic spruce and hardwood trees that rise up around the property. This wedding reception at the inn was held in a tent, allowing wedding guests to experience the scenery of the grounds as they celebrated. In this photo, guests mill about the tented reception, some still dancing and others preparing to leave. Those that are dancing are singing along to the last songs of the evening and participate wholeheartedly in the merry-making. Fairy lights line the canopy made by the top of the tent, casting lines of shadow across the ceiling. The lighting gives the scene a romantic ambiance, filled with music and the laughter and voices of the guests. 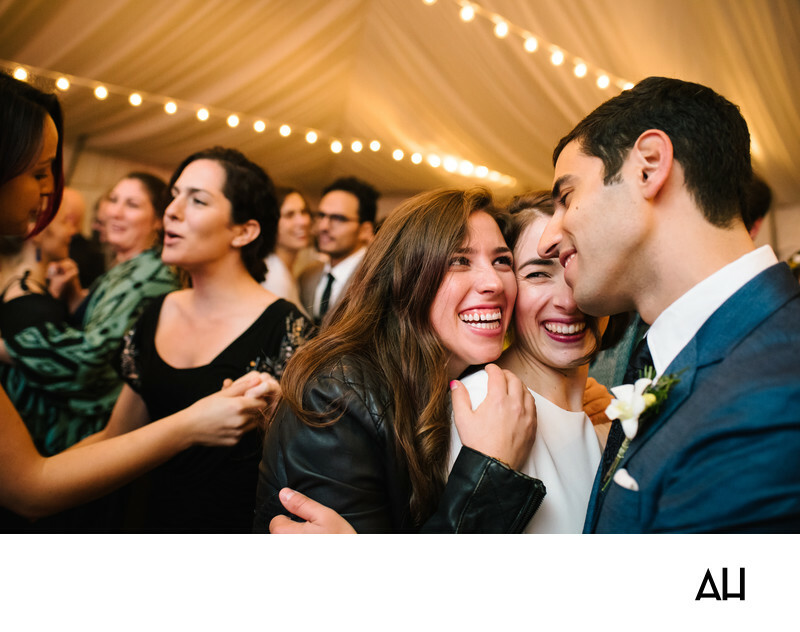 The bride and groom smile broadly in the right of the photograph, hugging one another and their friends. One friend, already in her black leather jacket, squeezes the couple, enveloping them in affection as she says her goodbye. The guest laughs with the newlyweds, congratulating them on their nuptials and throwing the groom a good-natured warning that he better take care of her dear friend the bride. At this point in the night the festivities have become one big pure celebration of love.